Were you cloud-inspired by Beret’s DIY Clouds? Have you been wishing there were more sort-of-cloud-related activities to do with your kiddos? 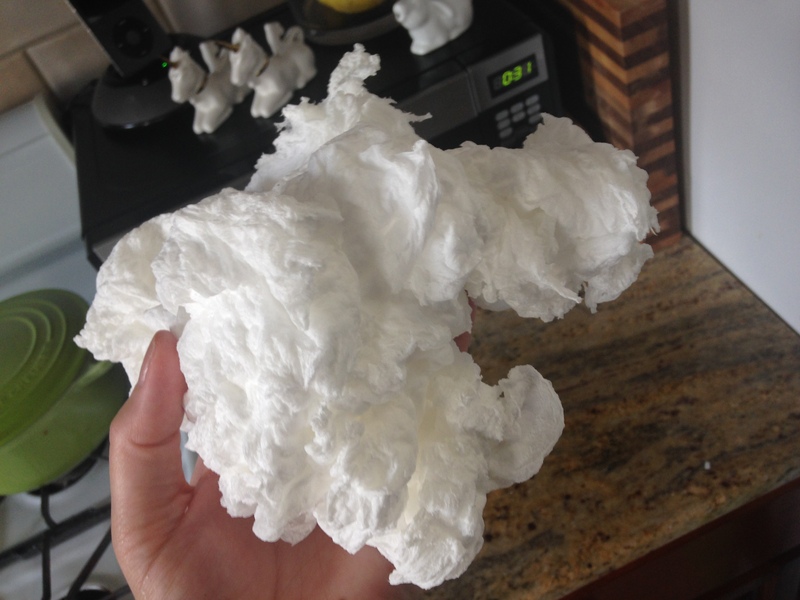 Have you ever wondered what happens when you put Ivory Soap in a microwave? I am here to help. 1. 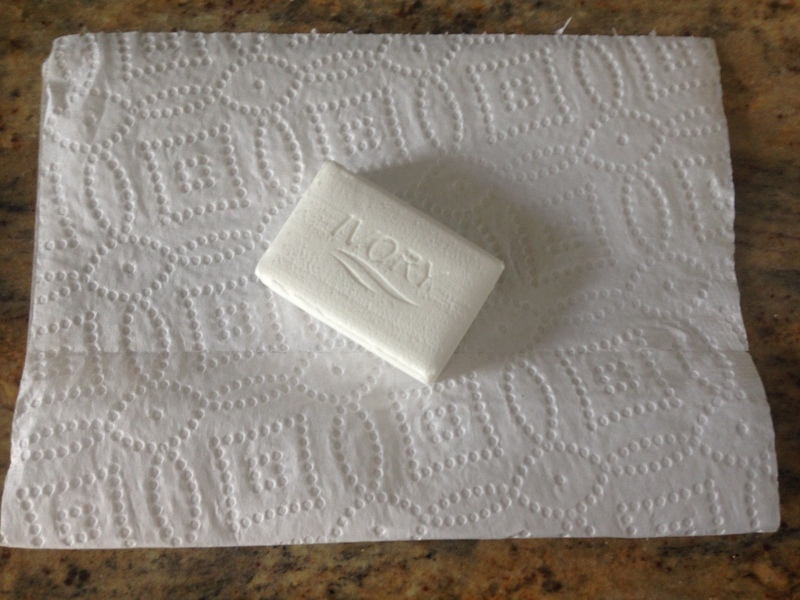 Put the soap on the paper towel. 2. 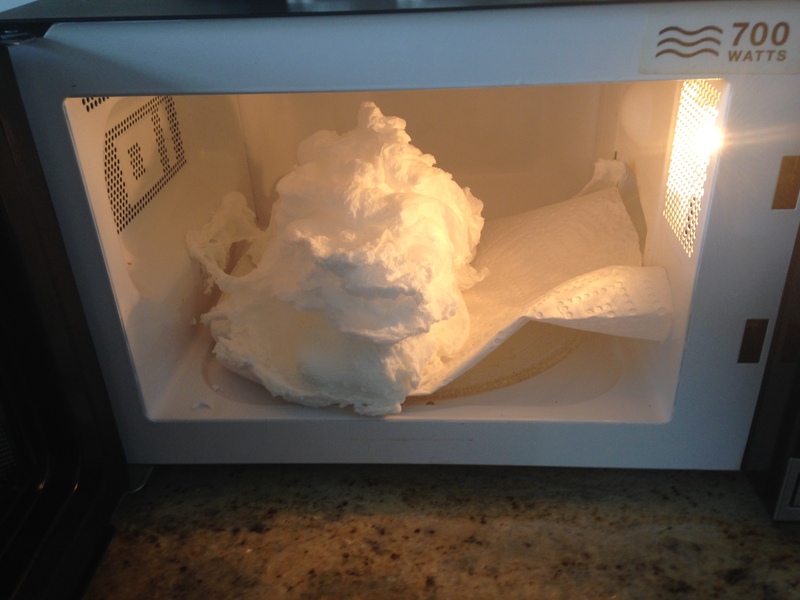 Put the soap and towel in the microwave and set for two minutes on high. I assume my microwave is always on high because I don’t know how to program it to do anything else. “Two minutes.” -Pauly Shore in some movie that Beret loves that she quotes in his voice every time this amount of time is mentioned. Now, you can’t really see what’s going on through the door of my microwave – it has some weird design pattern thing on it. From my limited view, I can assure you that things get cool REALLY FAST. Things getting cool. And fast. 4. Open the door and behold! 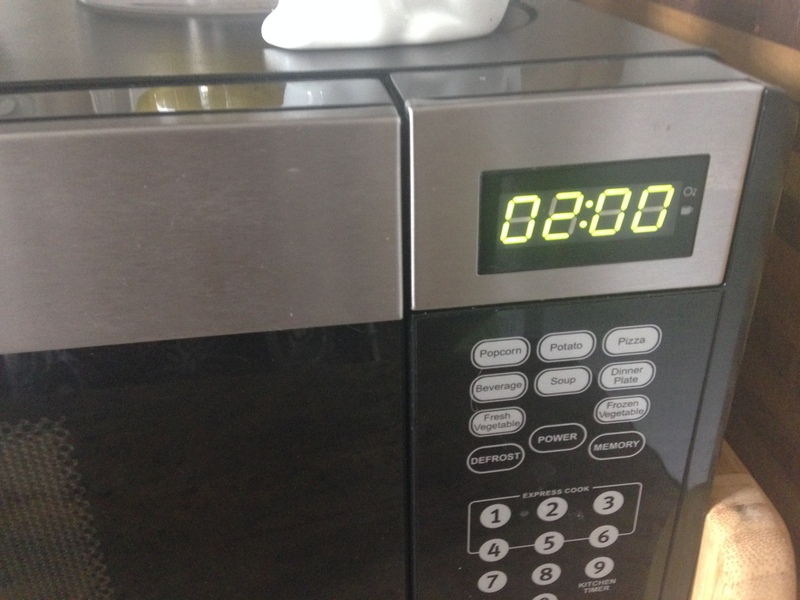 You smarty-pantses out there might have noticed that, according to the display on my microwave in the first photo, I panicked and opened the door at about a minute thirty. I do not know what happens if you cook the soap too long (anyone want to try for me? ), but I do know that when you cook it for one minute thirty there is a little wedge of still-in-bar-form soap left on the bottom. You can do this with smaller pieces of the soap as well, if you don’t want to waste the whole bar. You’ll have to experiment with timing on your own, though. 5. Play as you wish with your soap cloud. The soap cloud feels pretty much like you would expect a soap cloud to feel – kind of slick and fluffy at the same time. You can poke it, break it, mush it, and still use it as soap. I recommend doing this right before needing some stuff – or bodies – washed. As you probably know, Ivory Soap floats, and other soaps do not. (If you feel like staging a nifty pre-activity to this, fill a bucket or bowl with water and experiment.) Produced by Proctor and Gamble since the late 1800s, air is whipped into the soap as it’s being made, which means that it’s lighter than water. (Interesting bit of trivia: for years P&G claimed that the floating soap had originally been an accident that proved insanely popular, but admitted about ten years ago that floating soap was, in fact, created on purpose.) The air is not in the soap in pockets (which you can see for yourself if you break or cut the bar open) – which makes all the difference here. 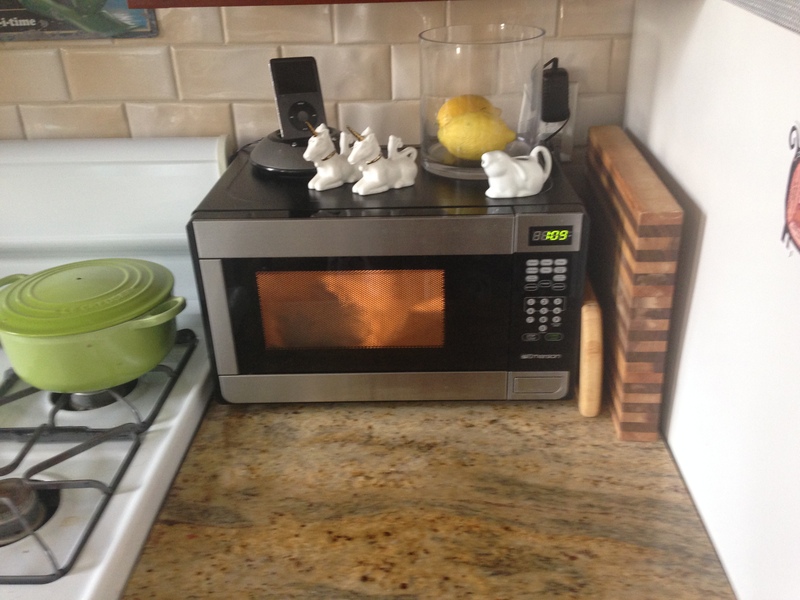 What happens to the soap in the microwave is largely the same as what happens when you pop popcorn. The air and water inside the soap heat up, the water vaporizes, and the air expands. The result: fluff-o-rama. Other soaps will simply melt in the microwave, but Ivory has enough air whipped in to cause this result. Ready for some impressive science terminology? This activity is a great illustration of Charles’s law (also called the law of volumes), which explains that gases tend to expand when heated. In other words, the volume increases as the temperature increases. Here is a fairly basic explanation. This is one of the easiest, cheapest, and most immediately gratifying science experiments I’ve done recently – highly recommended for personal amusement or science fairs. As a bonus, after I microwaved my soap, my whole apartment smelled great. “Two minutes” is a quote from Encino Man!!! I can’t believe I saw that movie of my own volition. P.S. I can’t wait to microwave some soap for two minutes. I’m that brave.